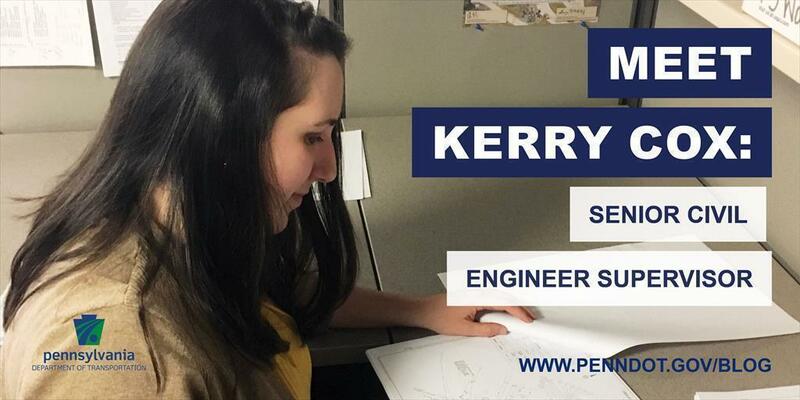 ​Kerry Cox is a senior civil engineer supervisor with PennDOT's District 5, which includes Berks, Carbon, Lehigh, Monroe, Northampton, and Schuylkill counties. In her five years with the department, she's also been an engineering and scientific technical intern, civil engineer trainee, and civil engineer for transportation. She currently is a project manager in design for consultant-designed projects. What made you want to work with PennDOT? I enjoyed my time with the department as an intern. Plus, the job security and decent benefits appealed to me. Seeing projects I managed in design get constructed, and assisting with the P3 Bridge Program. What is your favorite thing about working at PennDOT? The family-like atmosphere between coworkers. I truly value the friendships I have made and appreciate how we all help each other to get the work done. The enormous amount of work the department does and how much effort goes into keeping the transportation network running effectively. How much effort goes into a project. I'd like them to understand the many, many things that need to be accomplished during the design process prior to a project being constructed and completed. When people find out that you work for PennDOT, what do they say or ask? They generally ask about a construction project or the pavement condition of a roadway near them. I'm going on three years being married to my husband, John, and we have a daughter, Emma, who will turn one year old in October. Easy to get along with, and I have a good sense of humor. Right now, the baby takes up most of my time outside of work, but aside from that I enjoy going to the gym with my husband and hanging out with family and friends. I have a big sweet tooth, and I will almost never turn down an opportunity to get Chick-fil-A.